Replete with a cast of giants in Islamic thought and philosophy, Ahmad S. Dallal's ground breaking intellectual history of the eighteenth-century Muslim world challenges stale views of this period as one of decline, stagnation, and the engendering of a widespread fundamentalism. 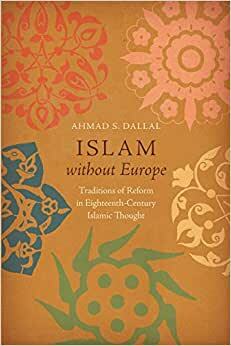 Far from being moribund, Dallal argues, the eighteenth century was one of the most fertile eras in Islamic thought. Start reading Islam without Europe on your Kindle in under a minute. Ahmad S. Dallal is dean of Georgetown University Qatar and author of Islam, Science, and the Challenge of History. This book definitely provided great insight into "reformers" and legal scholars in Islam in the 18th century. Overall, I found it to be very repetitive and had an overwhelming focus on al-Shawkani among the few other scholars described. I would’ve also liked to read about how these reformers actually "reformed" or affected their communities or the common Muslims at large, instead of just a discussion on the ideas of a select few people regarding Islam.